How much does it cost to travel to Cuba? How much money will you need in Cuba? 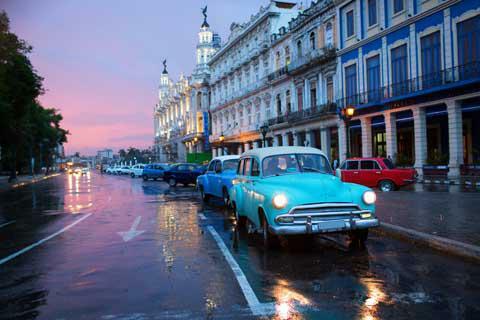 ₱462 ($17) is the average daily price for traveling in Cuba. The average price of food for one day is ₱240 ($9.06). The average price of a hotel for a couple is ₱316 ($12). Additional pricing is in the table below. These average travel prices have been collected from other travelers to help you plan your own travel budget. How much money do I need for Cuba? Cuba is the largest island in the Caribbean and also the closest to Key West. Despite its extremely close proximity, few Americans are able to make a trip to this fascinating and historic country. A U.S. embargo currently limits travel to the area, although some travelers reach the country through Mexico or elsewhere in Central or South America. Poverty is apparent in Cuba, but the locals are very welcoming to visitors. While much of the infrastructure in the country is in need of repair, in tourist destinations you will find very few problems. Throughout the country it is not uncommon to have power outages, but many popular tourist destinations are equipped with generators. Some of the more popular cities to visit include Havana, the capital city, Trinidad, a World Heritage Site with many colonial buildings, and Varadero, which is one of the more popular beach destinations in the country for tourists. Traveling around the island is most easily done by bus. There are several bus options, but the most popular with tourists is Viazul. These buses are typically air conditioned coach style vehicles that are equipped with bathrooms and televisions. They are generally efficient and reliable although breakdowns do happen. You can make reservations in advance. This may be required during peak seasons, but often you can purchase a ticket on arrival. The buses stop at highway restaurants in route, although the food is generally disappointing. You are better off if you come prepared with your own snacks. Taxis are another option, but they can be quite expensive for long trips between cities. They do offer a good option for travel within cities. You will find both government run taxis and unofficial, unlicensed taxis. You're unlikely to find many ATMs in Cuba. There are a small number in Havana, but those are unreliable. U.S. issued cards are not accepted anywhere. It is recommended that you carry enough cash during your trip and have some foreign currency on hand as well. Tipping in Cuba is encouraged. Even if there is a service charge added to a bill, give the attendant some cash, as they are likely to receive only a small fraction of the applied charge. Wages can be quite low, and a generous tip, although not required, is generally a nice and appreciated gesture, particularly if the service was good. If you're flying in or out of the airport, make sure your valuables are in a secure place. It's not uncommon for luggage to be searched after it's been checked and the valuables may be removed and stolen. If at all possible, keep your belongings on you during your flight. Renting a car is possible. The traffic is usually light but you will encounter plenty of pedestrians, cyclists, and others on the road. The roads are poorly marked so make sure you clearly understand where you're going before you begin your journey. It helps if you speak a little Spanish, but this is by no means necessary to enjoy your holiday. In touristy areas many people speak at least a little English. If you can try your hand at Spanish you'll quickly make some friends though. There are many ways you can experience the Cuban culture. Head outside of the more touristy areas and explore some off the beaten path neighborhoods. Take in a show or head to a local market and you're sure to have an interesting and one of a kind experience. By simply wandering through residential areas you will begin to get a feel for what life is like in Cuba. It is a great way to meet the locals and see what daily life is really like. Before you go to the effort of exchanging your home currency, make sure you actually have to. Many popular western currencies are actually accepted and this is the more financially beneficial way to pay for things. This will help you avoid loosing money in the exchange. ATMs are hard to come by throughout Cuba, but you will find a small number in Havana. US based cards are not accepted anywhere. Most of the ATMs are linked to the Mastercard/Cirrus or Visa/Plus interbank system. Looking for a party hostel in Costa Rica or Cancun? Looking for a budget hostel in Mexico or Costa Rica? Pilar Beach (Playa Pilar): This is a beautiful stretch of beach that is also popular for snorkeling. Pilar Beach is a popular destination for it's blue water and white sand. A taxi or local bus will take you there for a cheap price. Old Havana: Havana is an absolutely unique place and one of the most fascinating cities in the world. You must check out the buildings, people, and food in this historic area. You will feel like you stepped back in time. Partagas Cigar Factory: Take a tour of this famous cigar factory. It was established in 1845 and is one of the most well known brands of cigars in Cuba. Restaurants in Cuba are owned by the government but run by the employees. Most of the food prepared in restaurants can be frustratingly bland. You will find the best food in Cuba in either your casa particular or in paladares, which are locally run eateries that are located in private homes. You'll find paladares in even the smallest towns, but they do have limited seating so it is best to arrive early. Ask a local for the best recommendation of where to eat. Congri: This is a typical dish of rice and red beans that is made with spices and vegetables. It's a staple meal in the country and you are likely to find it for cheap almost anywhere. Ropa Vieja: This is a dish of flank steak in a tomato sauce. The dish can also be prepared with shredded meat, and unlike elsewhere in the Caribbean, it is not usually prepared with chickpeas or potatoes in Cuba. It makes for a hearty and filling meal, particularly at dinner time. Cocido de Garbanzos: This is a common chickpea stew that is made with a vegetable broth. It's often accompanied by rice and can make an affordable, but filling lunch option.